A while back, it was gently suggested to me that I may be suffering from Post Traumatic Stress Disorder. When I first heard this, I thought "well yeah, duh, of course I do. But what is there to do about it? Is there a point in labeling it?" I had previously allowed myself to believe that the symptoms that I suffer from each day are just part of my grief…they come hand in hand. Even though Mark does not struggle with any symptoms, I just chalked it up to the fact that we all grieve differently. This friend who suggested this to me (who is a very valid source on grief) responded by telling me that my grief can be separated from those PTSD symptoms - that they do not have to be my way of grieving…that I can still grieve without suffering so much in other ways. This was a revelation to me. If you have regularly read this blog, then you know that I have described most of these things, from time to time, in one way or another. I just never thought that they were something "to get fixed". So, what do I do about this? I have (with my Mom's help) been researching therapists who specialize in the treatment of PTSD. We have narrowed it down to one…and I just have to make the call. But I struggle to do so. I sit and stare at the phone number with my phone shaking in my hand and then I give up and move onto something else. Why? Why am I hesitating so? I am fearful. These miserable things that I suffer with are the only way I know how to grieve…and grieving is what keeps me connected to Vienne. My head knows that I can be taught to grieve in a different way…without suffering such physical and psychological effects…but my heart does not. My heart is clinging to the misery. It is all I know. Speaking from my own experience, PTSD hindered my ability to deal with and process grief. The physiological symptoms alone can make the rest of life difficult to manage. Counseling helped (and continues to help) so much. It doesn't take away the pain of trauma, but (IMHO) allows you to live in a way that honors your grief and pain while moving forward. Without help, I would have stayed stuck in a loop of fear that poisoned every good thing in my life. My story is very different from yours, so I don't want to speak as some authority on the anguish you feel. In some ways PTSD and grief are tied together, but unlike grief, PTSD can be addressed and treated. Experiencing this doesn't mean you are broken--it's much like going to the doctor to set a broken arm--it just means that as you heal, the wound may not be as disfiguring as it could have been. In my case that damage could have been permanently crippling (in an emotional sense). It may always be a sore spot for me, but it's no longer a festering wound that has no chance of healing. Samantha ~ Thank you for sharing. This was insightful to me. I don't know very much about PTSD, but it sounds awful...like a nightmare inside a nightmare, but it also makes sense that making the phone call would be really difficult. I can imagine anything that feels like it might disrupt your connection to Vienne would be terrifying. I just want to affirm that you are a beautiful, loved, and valued person - just like Vienne and Ivy are. Anyone who has met you or followed your blog would attest to that. You do not deserve to be suffering all of these physical and psychological symptoms. You'll be in my prayers as you take this next step. I'll be praying that it is a step that helps you feel more connected to Vienne - even though the way you are grieving might change. Mary Alice ~ Thank you for your sweet affirmations. These reminders warm my heart. I need the encouragements and thank you for your prayers. I love you very much and will be praying for you ...for each step you take! How I wish I could help share in carrying your unimaginable burden...people like Samantha do!!! And so many others through the loving replies here!! ......and that dear friend is the hardest part. Deep down, not wanting to let go of your grieving. The fear of once you stop grieving the way you have been doing, Vienne will disappear in some way. You certainly are still in a state of shock (in my humble opinion). Time and time again I have confessed I would be the same way, who wouldn't be? Don't be afraid to make the call. You have experienced horror far worse than any phone call you can make. It's worth a shot and ultimately in the end nobody will be able to change the way you feel about your daughters passing except you. You are surrounded by love and adoration. There are hundreds of people with their hands out stretched towards you, myself included. I can promise there is light on the other side of all this pain. If you have read about how my son died, you will see that I also suffered from PTSD (although I never "labeled" myself as that...). I found a great counselor and our family started going the day after Nate's funeral. 6 Years later...my husband and I STILL go see him. It was 2x/week for the first year (I wanted to go every day), then 1x/week and now we just switched to 4x/year. He has given me so much reassurance about how I was feeling as well as some really helpful strategies for dealing with a lot of it. I always find it to be a tremendous comfort to go see him. He validates me and my grief and my feelings like no one else in this world has. I strongly encourage you to give it a try. If you are not ready for that then please email me and I would be happy to share some of the strategies that I found to be lifesaving. I do know your painful story, Trisha. Thank you for taking the time to share and relate with me. Your knowing insight always means so much. We did try counseling for about 6 months but PTSD was never addressed. For a while it was nice to be validated in all my feelings…but it was lacking tools to walk away with and apply. I think he felt reserved because he knew he couldn't fix my grief and maybe I wasn't clear enough about my inner battles. Now that I've asserted all of this, I feel that a therapist, a real doctor might be best suited for me. We found a good one in the area who shares similar spiritual beliefs which will be important for me, as well. I'm sure I will update on here….once I actually make the call and get an appointment. I am intrigued by the strategies that you learned. Perhaps I will email you when I am ready. I think finding the right therapist is very important, someone you feel comfortable with and someone you trust. Once you find that right person and when you feel ready, I'm sure you'll discover there are coping techniques that you can actually learn. I don't profess to have gone through anything near as traumatic as you have but I do know of a family (the Coble family) who lost all 3 of their young children in a car accident and said had they not sought therapy, they most likely would not be here. 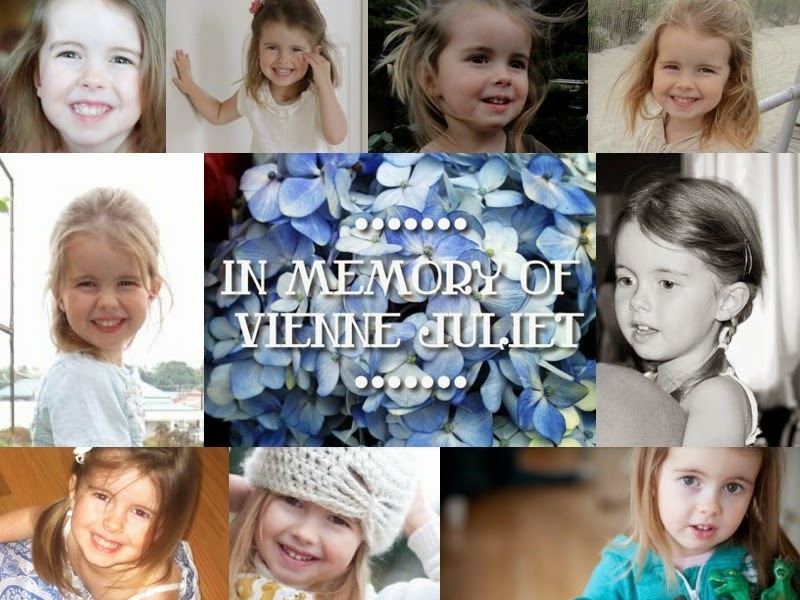 As for Vienne, you have and continue to share your beautiful girl with all of us who read here. That little girl and her short but meaningful life has impacted many of us, even if it's just to take more time out of our day to let people know we love them and are thinking of them. In your own time Friend. Don't hurry yourself. You've made the first step by identifying the PTSD. As I've watched you go through this process, I've seen each step take place just as it should. Be gentle with yourself and do only what you feel you can take on. Of course, you've proven to be strong and resilient, and I have no doubt that you will continue on in that way. I love you so very much. You have encouraged me to go see a therapist. I have been thinking about if for a while now but didnt really know what to do for help. I know we both need help to sort out the 'bad' PTSD feelings that don't allow us to grieve properly. I feel like I am stuck sometimes on that exact day and those exact events, the smells, the feelings, the raw intensity of it all....love you lots...and I am looking forward to hearing how your time was with the therapist. How insightful your friends are, Jenny! I feel more enlightened to the turmoil of your plight just by reading the notes from the loving crew who send their love to you. I am encouraged for you that you have moved towards further healing of your broken spirit. I will pray that the warfare that torments you will be overcome by the prayers of those who love and surround you, releasing you from the grasp of that strangling hold that keeps you stuck on the other side of that phone number. Kudos to you for straining on, researching, honestly naming your feelings, and bravely posting your struggles here. I can't imagine how vulnerable and exposed that must make you feel to invite us all in to walk with you. I pray that you feel protected and honored as you choose your pathway to healing and freedom. I applaud you, my beautiful daughter…for sharing where you are right now, which invites replies of love, encouragement, insight, truth and wisdom into your ponderings and processing. So many beautiful insights here wrapped in love from an amazing group of supporters. You may not feel an intimate connection with God Himself yet…but He is surely using His people all along to love you, support you, encourage you…just to "be" for you in tangible ways. This is really interesting, You are a very skilled blogger. I have joined your feed and look forward to seeking more of your magnificent post about PTSD.